186 Dickson Drive is a mid terrace villa situated in a popular residential area of Irvine. The property benefits from a fully floored and lined loft accessed via a fixed staircase. 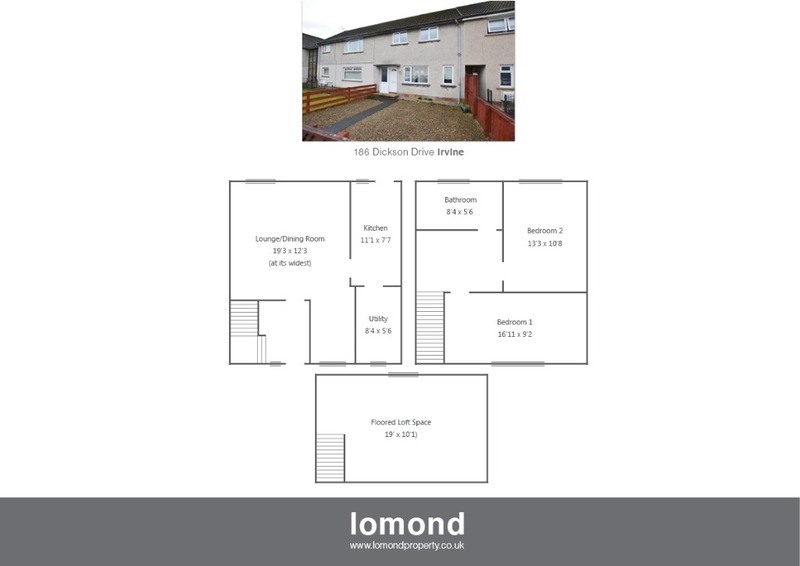 The remainder of the property comprises two double bedrooms, spacious lounge/diner, bathroom, kitchen and utility area. Externally the property comes with gardens to the front and rear with optional off street parking to the rear. In summary the property layout extends to an entrance vestibule with stairs to the upper level. The ground floor space is generous throughout with a large open plan lounge/diner with French doors to the rear garden. Off the living room the kitchen is well presented with modern fitted units, and in turn allows access to the utility area. Access to the rear garden can also be gained via the kitchen. The upper level houses two bedrooms, both of which are doubles and a shower room. Access to the loft space is gained via the fixed staircase off the main bedroom. Externally the property has gardens to the front and rear. To the front the garden is laid to decorative chips, with perimeter fence. To the rear the garden is laid predominantly to lawn with timber decking ideal for summer dining. Dickson Drive is an established and popular residential area. Irvine town is close by and provides access to a range of amenities including supermarkets, bars, restaurants and town centre shopping. There are a number of local primary and secondary schools within the Irvine area.